DENVER, Colorado, February 4, 2013 (ENS) – Under a court-ordered deadline, the U.S. Fish and Wildlife Service today proposed to protect the North American wolverine as a threatened species under the Endangered Species Act. “Extensive climate modeling indicates that the wolverine’s snowpack habitat will be greatly reduced and fragmented in the coming years due to climate warming, thereby threatening the species with extinction,” the Service said Friday in a statement announcing the proposal. “Their dependence on persistent spring snowpack for denning makes them severely threatened by climate change,” said Greenwald. 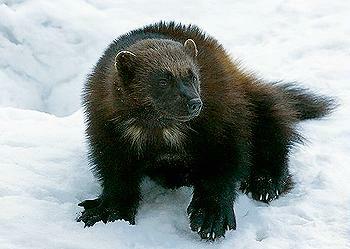 “This proposal would give us the flexibility to tailor the protections for the wolverine provided by the ESA to only those things that are necessary,” said Noreen Walsh, director of the Service’s Mountain-Prairie Region. Scientific information regarding these proposals will be accepted until May 6, 2013 and can be submitted electronically via the Federal eRulemaking Portal at http://www.regulations.gov. Follow the instructions for submitting comments; or mailed or hand delivered to: Public Comments Processing, Attn: FWS-R6-ES-2012-0107; Division of Policy and Directives Management; U.S. Fish and Wildlife Service; 4401 N. Fairfax Drive, Suite 222; Arlington, VA 22203.